Why I Chose a Person of Color as the Main Character in my Children’s Book, Even Though I’m White. Earlier this year, I self-published my first children’s picture book. It is a story about a little girl who accidentally gets caught in a cloud. She enjoys a relaxing ride, until a storm breaks out and the cloud drops her into a rushing river. The rest of the story is about her long journey home, and her heartening reconnection with her grandfather. I both wrote and illustrated the story, and I had total freedom to direct the content of the book. "Overall, the social networks of whites are a remarkable 91 percent white. * White American social networks are only one percent black, one percent Hispanic, one percent Asian or Pacific Islander, one percent mixed race, and one percent other race. In fact, fully three-quarters (75 percent) of whites have entirely white social networks without any minority presence." When it came to illustrating my book, I felt like it was important, within my small sphere of influence, to challenge these trends, and to make aesthetic decisions that reflected my own personal concerns with racial inclusion and justice. One part of this is that I value diversity; I was raised in diverse settings, and my husband and I are raising my two white sons in diverse settings. 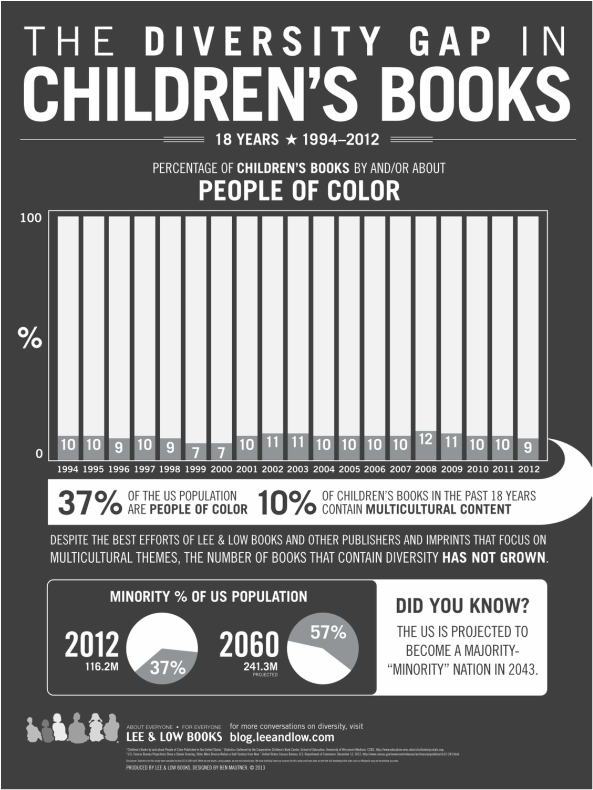 The kids who will read my book are not all white. We are part of a diverse global civilization, and to suggest anything different, even in something as seemingly benign as a picture book, just isn’t in line with reality. But there is more to it. As my sons get older, although I want them to hold on to the principle truth that there is only one singular human race, I also want them to understand how white supremacy has functioned nationally and globally, in the past and in the present, to silence and subjugate people of color. I want to impart upon them that as young white men growing up in the USA, they are part of a particular legacy, joined-at-the-hip with slavery and genocide, and that they therefore have a unique role and responsibility to work towards racial justice. This isn’t coming from a place of shaming, but rather a place of spiritual exploration. The teachings of our faith tradition, the Baha’i Faith, revolve around the principle of the oneness of humankind. Our Sacred Writings from over 100 years ago state, “The earth is but one country, and mankind it’s citizens.” If humanity is one, why do such inequalities persist? Where did they come from, and what can we each do, from our respective social positions, to resolve them? These are questions can help shape one’s life journey and purpose in this world, and they enhance one’s own search for identity and meaning. This is obviously a discussion that will unfold over years, and will not take on such harsh specifics until they have the intellectual and emotional capacity to process it (my boys are only 4 and 1 right now). But the conversation has to start somewhere, and I think for young children, it begins at just being aware that there are many different kinds of people that we share this world with, and that all of them are entitled to love and care. I based my main character off of a friend of ours, and I’m sure that when my kids eventually understand that their friend faces certain challenges in society simply because he is Black, they will have that much more passion to transform society.